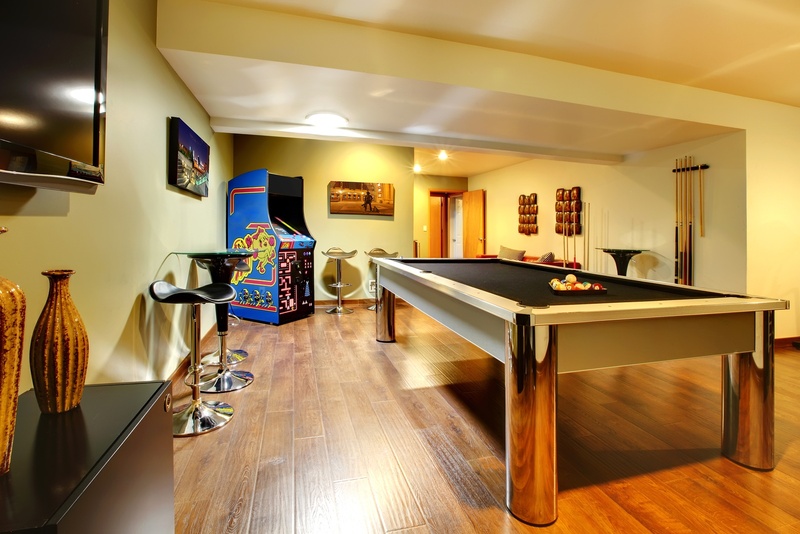 Whether you are using a basement or you have another large space in your home, creating a game room can be great fun for the whole family. There are so many ideas out there when it comes to creating a game room we decided to gather the best tips so you can get straight to creating an amazing space. The ultimate game room should be a space your family loves to gather in. Here are some tips and tricks to help make your new family space a success. Plan it Out - It's important to consider how much space you have before you decide what to do with your game room. Large spaces can hold multiple areas including a movie/gaming space, pool table, bar area and multi-game area. A smaller space may have more constrictions and you may have to limit the activities you have in the room. Lighting- If you are going to have a movie/game room and you have windows you will want to control the lighting. Installing blackout shades can help control reflections on the screen and make the room more inviting for movie and game time. If you have a lot of windows you may want to customize the window treatments to suit the room’s purpose. Small Spaces - If you enjoy board games or small games like shuffleboard you may want to create a smaller, cozier game room. If this is the case consider shelving and hanging space for the games as well as a place to store snacks and drinks. You will also want a large table where family and friends can sit around on game night. Soundproof - Whether you are watching movies or playing ping pong the noise level in a game room can sometimes be disruptive to others in the home. Consider adding insulation or sound panels to the walls to keep the noise levels down. Furnishing - The right furniture is important. Comfortable seating will allow you to relax in the space. Create a bar or lounge area for when your family and guests need a break from playing. If you are creating a movie space be sure to have comfortable couches. If you will have a lot of gaming going on, there are special gaming chairs that will keep the kids comfortable. You may also want wall shelving and hanging space depending on what type of games you will have in the space. If you are creating the ultimate game room in your home and would like help with custom window shades, the team at Polar Shades can help. We offer a range of window solutions including blackout and motorized shades. Contact Polar Shades at 702-260-6110 today to find out more about our full range of high-quality window treatments products and for a free in-home consultation.